Most American pet owners consider their pet their best friend, a notion supported by a comparison of the number of pet owners and the increase in pet retail sales: While the number of people living in households with at least one pet and the number of people who have shopped for pet supplies have been consistent over the last few years, consumers have been spending more and more money for their pets, thus boosting pet food retail sales in the United States. Most expenses for cats and dogs in American households are due to vet visits, however Americans like to spoil their pets as well; almost half as much is spent on treats, grooming and toys. Quantitatively speaking, fish remarkably outnumber all other pets. 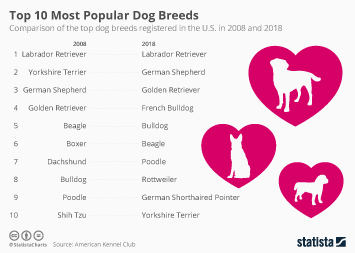 However, dogs are still Americans’ favorite pets, as they are most prevalent within American households – closely followed by cats. Most Americans who grew up with pets stated that their childhood pet was a dog (again, closely followed by velvet paws). Both dogs and cats are preferably adopted from family members, friends or shelters.